Najiba is ill with weeping infected blistering lesions around her mouth which should be easily managed with an antibiotic. I can only hope that the Afghan medic knows what to do. Her child looks even more ill. 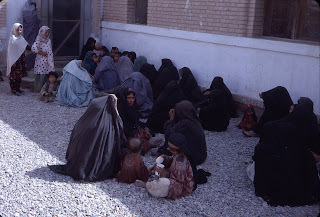 They have been waiting with forlorn patience for hours sitting on the ground outside the clinic in Laskar Gah in the desert heat of the Helmand Valley . As a medical student in 1962 working for the summer in Afghanistan, this is my introduction to medical deprivation. The Afghan medic briefly looks at her and the child, writes a prescription on a piece of paper in Farsi and says, "next." As an observer collecting research data on infant mortality (continues at 30% within the first year of life), I feel so helpless. Another mother on the way out begs me to look at her child's ear. An otoscope is produced, and I see a protruding black object from the child's left ear canal. Somehow with a hemostat I manage to remove a wriggling cockroach. One small thing accomplished but such a feeling of overwhelming impotence. 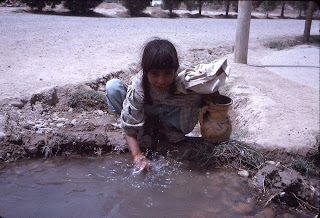 The child drinks water is from an open ditch. She has round worm (Ascaris) infestation in her bowels, a nearly universal finding in Afghan children who have no access to clean water. Immunizations are rare with smallpox common. In the late 1960's Peace Corps female health worke rs travel from village to village with an eradication campaign. 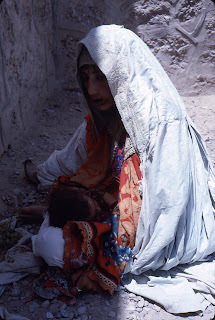 Small pox disappears from Afghanistan but water born diseases remain. Infant diarrhea and dehydration leading to death is all too common. Two ex-US Army nurses enlist as Peace Corps pediatric nurses in a Kabul Hospital. I watch them with disbelief. The child arrives sick, dehydrated and with a weak cry. He needs intravenous hydration but no IV fluids are available. Also not available are sterile needles, saline, or gloves. The nurses boil up a saline IV formula along with some reusable needles and 50 cc syringes. Bare handed they place their finger over the end of the syringe, pour in saline, attach a needle, and inject the saline into the infants left flank. They then repeat the procedure with the same needle, into the right flank. The infant is gently handed back to the mother who left with a glint of hope in her eyes, saying "Tashakor." (thank you). A woman from a village 50 miles away is pregnant for the 8th time, having lost four of children to illness. But this time she is very ill, at term pregnancy, in labor yet having severe abdominal pain. The Afghan doctor says, "It's likely a ruptured uterus." The visiting American OB-GYN says, "No one could walk in with a ruptured uterus, it must be an ectopic pregnancy." At surgery, the uterus has indeed ruptured and the child amazingly survived. They explain to me that Afghan women lack Vitamin D, have no sun exposure, and lose calcium from breast feeding and multiple pregnancies. The bones soften and the birth canal narrows, leading to the obstetrical emergency and uterine rupture. The young man lies on a charpoi bed in a remote village near Maimana in the north. His father pleads with me to come to his house and examine him. The young man is thin, a teenager, embarrassed and uncomfortable - possibly in pain. The father gently lowers the bed cover and I'm shocked. The left testicle is hugely swollen about five times the normal size. It is rock hard with similar hard enlarged lymph nodes in the groin. The cancer is obvious, even treatable. Again I'm helpless as a medical student. I write out the name of an excellent surgeon at Kabul's Avicenna Hospital and advise the father that some help may be available there. I told him I hope that his son does well. The father nods, and adds accepting his fate, "Enshallah." (Allah willing). Comment: I returned to Afghanistan in 1965, a relatively peaceful time under King Zahir Shah. In the US Public Health Service assigned to the Peace Corps, I provided health care for the volunteers and did programming work for the volunteer health care workers. The Afghans were eager to learn English and improve their skills in many fields. Yet they were proud and naturally mistrustful of foreigners given their history. We were "non-believers". The stories of the British invasion and occupation in the mid 1800's were passed from generation to generation. They are a proud people, tribal, and independent. Yet we found them respectful and friendly with a quick smile. I have great respect for the young Americans serving in the Peace Corps. These were the early days of the Peace Corps when Sargent Shriver was still the director. I still remember my interview with him and the huge picture of the Kennedy family hanging on his office wall - quite daunting. Dysentery was a way of life for the Peace Corps there and bowels became the frequent subject of complaint and humor. There were amoeba, giardia, salmonella and, of course, worms. An urgent call comes from a volunteer, "I've got worms, I've got worms." "OK, it's OK. We've got really good medication to get rid of them. Come on in." She replies, "But you don't understand!" "It's only half way out!" These round worms are often not a major issue and pretty easily treated. But they can enter the appendix or bile duct and cause acute obstruction - or even at times bowel obstruction. We hear a lot about war injuries, but lack of basic medical care continues to be a huge problem. An Afghan doctor is trying to open a large outpatient urgent care center in Kabul, built with funds from the US military. But the local university medical graduates have very marginal training. 80% of them failed a very basic skills test and none of them had ever sewn up a laceration. There's a long road ahead, even after the violence ends. In retirement I get a lot of inquiries from family and friends about aspects of their disease or care. I try not to be intrusive and to mostly provide reassurance, but sometimes I just can't stand by. My sister in rural Pennsylvania had severe shortness of breath and also a known leaky heart valve (stable since childhood). A local cardiologist told her she needed three heart valves replaced! This was so over the top that I "interfered" by advising her to head to the relatively nearby Cleveland Clinic (her records didn't arrive so it took two trips there). The description of the consultant she saw there was a disinterested "cold fish." He told her no surgery was indicated and that all she needed to do was lose weight. He saw no need for further tests or referrals. So I entered the picture again and contacted a Pulmonologist at the University of Pittsburgh Medical Center who was very gracious. Doctor's don't necessarily look forward to being the third consultant - basically a referee. He did pulmonary functions, CT scans and cardiac ultrasounds to evaluate her pulmonary hypertension. My sister subsequently went all the way through a thoracoscopic lung biopsy which unfortunately showed a serious irreversible lung disease. I check in by phone with my sister every few days. She is now on Hospice care, but the Hospice base is 40 miles away and several different RN's have been to see her. In treating her shortness of breath she got pretty goofy and unstable on the sedative/narcotic regimen so they put her in the inpatient Hospice Unit for a week. She's pretty much bed ridden, on oxygen and at peace with her Swedenborgian-based belief that she will pass into a vibrant spiritual world in a much more perfect disease free spiritual body. Although, she's reluctant to leave her beloved husband and extended family behind, she's actually looking forward to the day when all of the family can be together once more. After coming home from the Hospice Unit, she casually mentioned that she really felt hyper, shaky and jittery. After reviewing her meds, we discovered that she was on both long acting plus short acting asthma inhaler meds. So I said, "check with your medical team, but for now stop the short acting albuterol and use it only as needed." The jitters resolved. I told her to send my apologies to her team and that I'm sure they would have given the same advice. In general, doctor's are advised not to provide direct care for their families. That certainly didn't apply to our family when we were kids. My father was an "old time" family doctor. We got our ears checked, penicillin shots, etc. by going into dad's office after school. I stitched up my son's laceration at a Boy Scout Camp when I was the doctor there. It would have been silly to send him back to Seattle. Of course my son, now a lawyer, still points to the scar on his knee and says, "boy, you can sure tell that wasn't done by a plastic surgeon." The label of nurse or doctor carries over to the stage of retirement. I hope I have been of some help to my sister, but it's a balancing act. In general, being supportive with bits of education and reassurance is probably the best medicine we have to offer for our own families. Martha's death was difficult but not unexpected. She had been in and out of the hospital three times in the past six weeks. Her husband was there at the end. About an hour later I got a call from the son, John, who hadn't been around much. He was upset, angry and aggressive: "Doctor, you killed my mother. I want to meet with you and my lawyer there today!" I think I must have surprised him by saying, "OK, how about 2PM today." I had just had a patient cancel and had a free spot. I arranged for a conference room since I didn't know how many people would be there. Medically, I didn't think I had done anything wrong and was reluctant to generate unnecessary tension. I was pretty certain that if I called the hospital's legal department that they would want to meet with me first and then perhaps be at the meeting. I had been in enough contentious situations over the years and I didn't want this one to escalate. Also, I had enough gray hairs, that I'd been in similar situations before. So I ordered up all Martha's records and took them to the third floor conference room next to the library. Four family members arrived: John the son, Ed the husband, Mike the brother-in-law and Sue the patient's sister. I asked whether their attorney was coming, and Mike said he was a tax attorney in Seattle. So John's initial challenge that he would bring "his attorney", turned out to be a family member who wasn't a litigator. After introductions, I asked John what the concerns about his Mom's care were. He said, "I think she got too much morphine and it killed her." I said, "Let's review the care and medications she received. Here's the chart so we can all review it and look at the medication record and the nurses notes. First, I think we all know that Martha had very severe emphysema. At age 81 she was weakening and her lung function worsening despite aggressive use of prednisone and inhalers. Infectious were vigorously treated with antibiotics. But she was slowly suffocating even with oxygen." Mike said, "Well, where does the morphine come in." "Good question. Martha had decided that she didn't want to be put on a ventilator because her quality of life was so poor, yet she felt panicked often being unable to catch her breath. She said she felt like a fish out of water. Indeed her carbon dioxide was climbing and her oxygen levels falling in her blood gas samples. The end wasn't far away." "OK, but what about the morphine, John interjected." "Well, your Mom was becoming agitated, not making sense and beginning to cry out. At that point I talked to your dad, John, and told him morphine or a sedative would help your mom be more comfortable. So we began small doses to try to titrate care for comfort." Mike said, "Is that right dad?" "Yes, Martha was so uncomfortable and so confused. I felt we needed to do something to make her more peaceful. I felt she was dying." "Let's look at the medication sheet. The nurses gave her 1 or 2 mg of morphine at each of these times over a three hour period. The total dose was 10 mg. Although it could be argued that the morphine speeded up her death by a matter of minutes, the morphine did several positive things for her. It releaved her anxiety, decreased her sense of shortness of breath, and basically relaxed her as she drifted into sleep and ultimately death. Without the morphine she would have had a miserable death." By this time John had calmed down and began to realize that he needed to support dad. I relearned the lesson that all family members need to be involved at the end - with active outreach if they aren't there. There seems to be a direct correlation between anger and distance from care. Comment: Over the years, I would come to insist that all family members be involved in the family conferences. We would arrange conference calls so "Aunt Minnie for Minneapolis" could be there and feel included. Allowing all concerns to be addressed, transparency of medical records, admitting our own shortcomings, and wishing that things were different were all "OK." In this case, I should have brought John, the son, in much earlier so he could understand the issue of palliative use of morphine in end stage lung disease. Mike sat by his mother's bed saying to her, "Mom, hurry up and get well so we can go to Puerto Vallarta". The problem was there was no way to tell if anything was registering with Midge Jackson, his Mom. She was on life support, heavily sedated and things didn't look good. Mike was a firefighter and an upbeat take charge kind of guy. He was with Mom most of the time he could spare and, as her doctor in the ICU, Mike and I were in frequent communication. I first met Midge and the family in medical crisis - unfortunately not an unusual mode of initial contact in the ICU. The call came from my surgical colleague, "We're sending a patient to the ICU post triple A and her pressure is falling, could you see her?" The "triple A" was an abdominal aortic aneurysm replacement in this 76 year old woman. The large trunk of an artery in the lower abdomen was threatening to burst and she had just survived the urgent surgery which replaced the aneurysm with a sizable graft. Initially Midge seemed to improve and we thought she was stabilizing, but then an intestinal bleeding occurred. After transfusions, the GI specialists found stress ulcers in the stomach and got the bleeding stopped. She remained on life support and the lungs began to fill up with fluid. It became hard for the ventilator to give enough support. We were concerned about both giving too much oxygen or too little, too much pressure or too little ventilation. It was difficult but I advised the family that she had a reasonable chance of pulling through this new complication, adult respiratory distress syndrome. At week three in the ICU Midge's lungs weren't much better, but they weren't worse either. Mike the firefighter kept saying to Midge, "Come on Mom, get better. Remember we're going to Mexico." Midge was minimally responsive to her environment but could open her eyes and more all her limbs, so the family knew she was still there. At week five after surviving a bout of urinary infection, Midge's temperature spiked to 104 and the blood pressure and urine output fell drastically. We did the usual cultures and big gun antibiotics but in a day found out that a yeast type fungus was growing out of her blood. We began anti-fungal medications, but things didn't look good. Some of the staff began to wonder if we were really doing Midge a favor keeping her alive this way. Mike, however, correctly stated "I don't think you can say she has a terminal diagnosis. Do you think so?" We had a family conference frequently and were almost at the eighth week now. Some family members began to say that they weren't sure that Mom would want to keep going like this. But they, and Mike, all described Midge as a vital person who really loved life and "wasn't going to go easily." I felt that the family was indeed acting in Midge's best interest but told them that if there were further complications like a stroke or heart attack or kidney failure that the outlook would be grim. One day in the 10th week, like magic bowel function returned, the blood count normalized and then the lungs began to clear. We lightened sedation and she began to respond and have weaning trials off the ventilator. Mike kept saying, "Mom remember, it's Puerto Villarta for a cerveza." After nearly three months in the ICU, we celebrated the day that Midge was able to transfer to the medical unit under the care of the Hospitalists there. It felt like a graduation, but the attempts at rehabilitation had just begun. She needed lots of strengthening and physical therapy. At that point I lost track of Midge except that I heard subsequently that she had gone to a skilled nursing facility for intensive physical therapy. Comment: Unlike many elderly ICU patients Midge's case was gratifying and one that the nurses and I would long remember. It was humbling to think that we were becoming discouraged and wondering if it was wise to push on with life support. The huge advantage that Midge had is that she didn't have a terminally disabling medical condition. Her care could never be called futile. My readers may not believe the following, but it is absolutely true! In the spring of the year Midge was discharged from the hospital, our family was at the airport boarding a flight to Puerto Vallarta. Out of nowhere and from across the lobby, I heard a shriek, "There's my doctor, you saved my life." I only saw a nice white haired well groomed elderly lady and wondered whom she was calling out to. Then I saw Mike, and began to recognize Midge with a smile. We were on the same flight to Puerto Vallarta and even managed to have a cerveza together there.